Since the previous edits have changed again in, I thought I'd just redo the first post here. 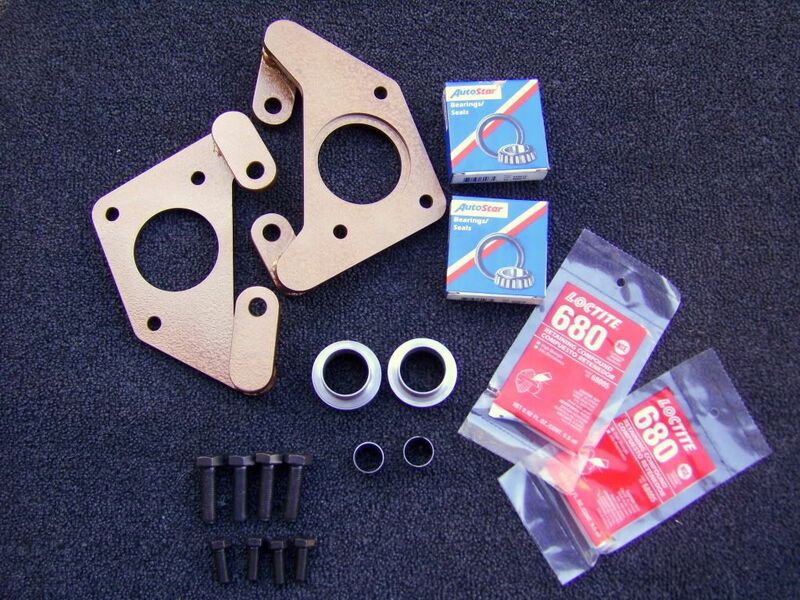 This kit will allow you to mount up hubs/rotors/calipers from an '83-85 Datsun 720 2wd truck. 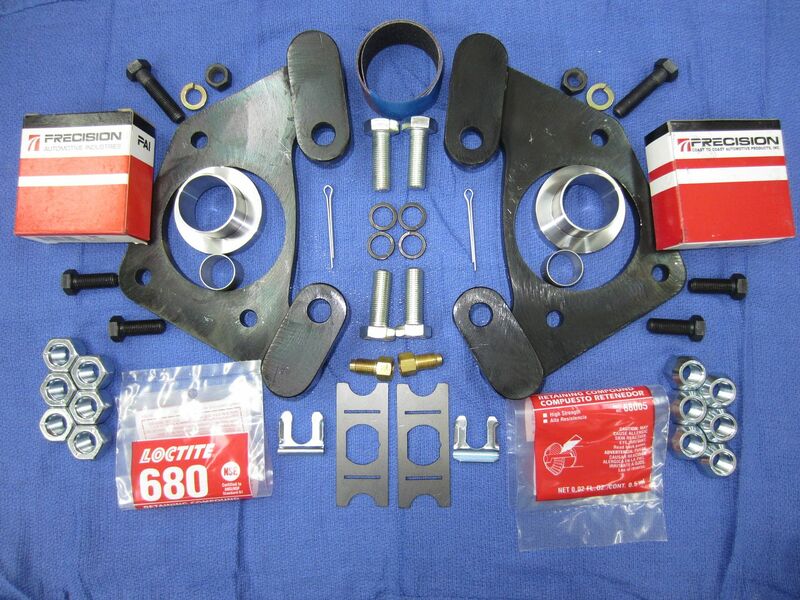 This kit will work on 320-521 as pictured. 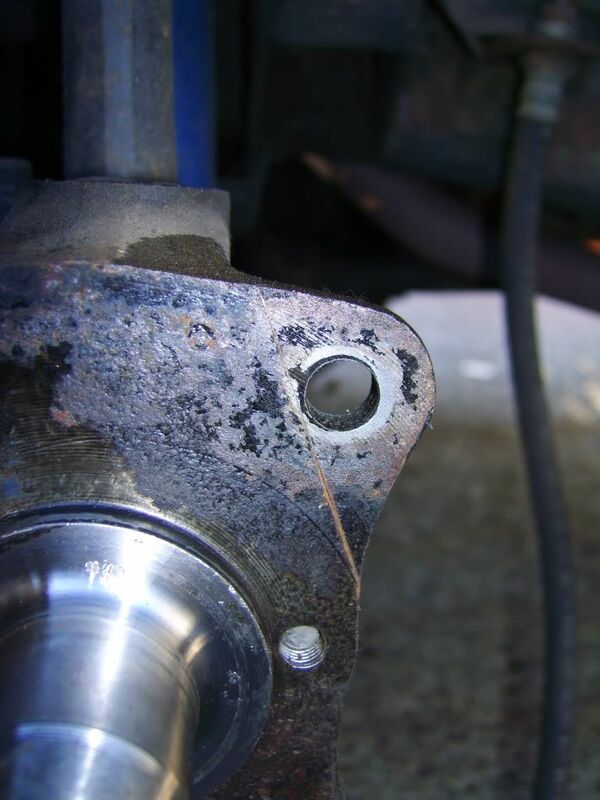 It will also work on 620(drum trucks) but I will have to mod the inner bearing adapter and change out the bolts. Here's the info for the donor parts. You MUST get the hubs from a donor truck. I've heard that the Hardbody hubs can be bought new, but I have not looked into it since they would need to be machined to work with most rims. The rest you can buy new. When you get the hubs, you MUST keep the bolts that hold the rotor to the hub. These next pics will give some part number. Please note the build dates in the last of these 3 pics (11/82 to 10/85). The earlier hubs will still work, but the rotors and calipers will not(they're the same as the 620's). The later hubs will work, but they will need to be modified to fit stock rims. 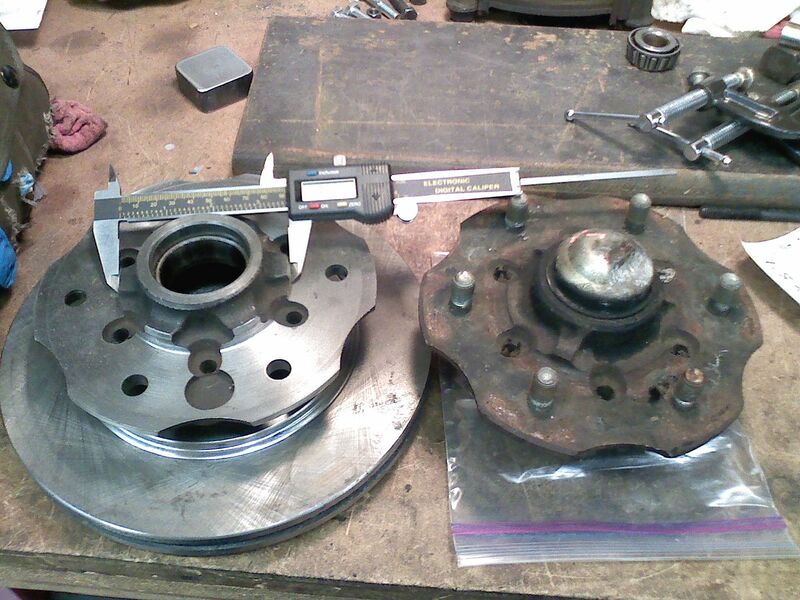 The later calipers are the same as well, but the rotor will not work. Please note that in the second pic, the wide range of years is for the calipers only. Here's some pics of hubs. These are 720 hubs. If you look closely, you can see very slight differences in the "nubs". The 3rd is an early hub, probably '83. 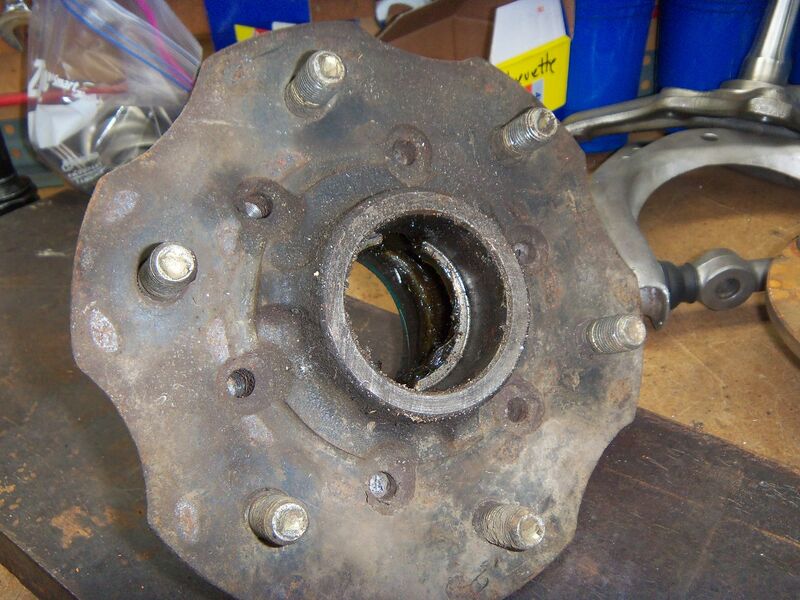 The last pic is of a Hardbody hub that has been modified to work with a stock rim. ...and a couple of vids of putting the adapters on using heat. Previous kits came with the press fit adapters. Due to slight tolerance differences in spindles and adapters, some adapters were really hard to install. 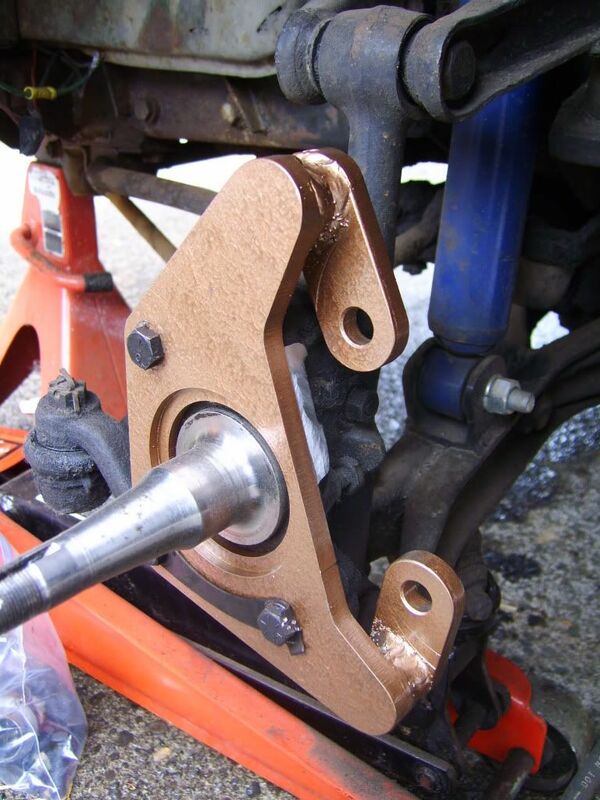 The current kits have returned to the slip fit adapters which mount with Loctite 680. I did some mock up today with stock 320 and 521 rims. I've always said that this kit fit stock rims, but may possibly need a 1/4" spacer. 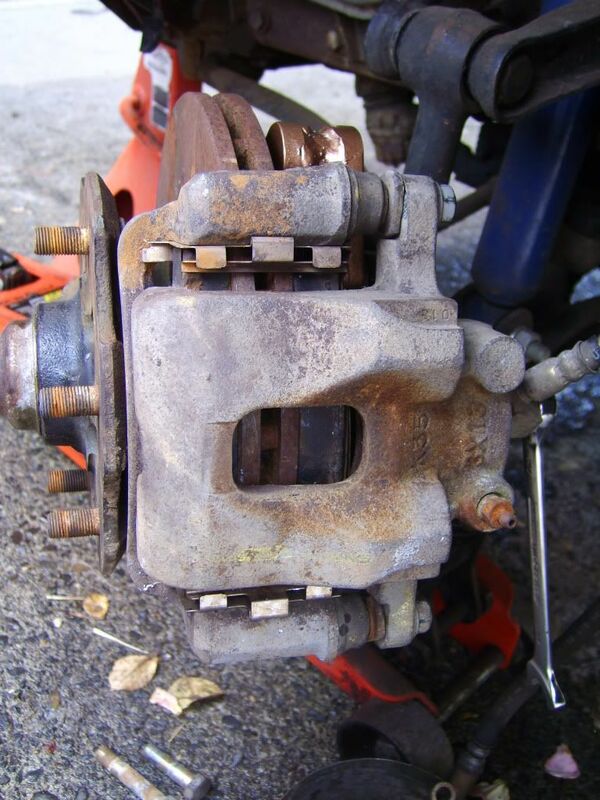 There's been a case where the caliper had to be ground on a bit to clear. I finally figured out what was going on!!! I did my checks and mockup with used brake pads!!! They clear just fine, but the pads were about 1/2 gone. With new pads, I can see where some grinding or a spacer would probably be needed. I'll see if I can do up some CAD art to have 1/8" or maybe 1/4" spacers laser cut out of steel. I probably haven't heard any complaints because they either haven't been installed or they were not running stock rims. Anyway....I just wanted to clarify this since I've been getting more and more questions about running stock rims. Long story short...to fit stock rims, it will take 1/8" wheel spacers and possible a small amount of clearance grinding. 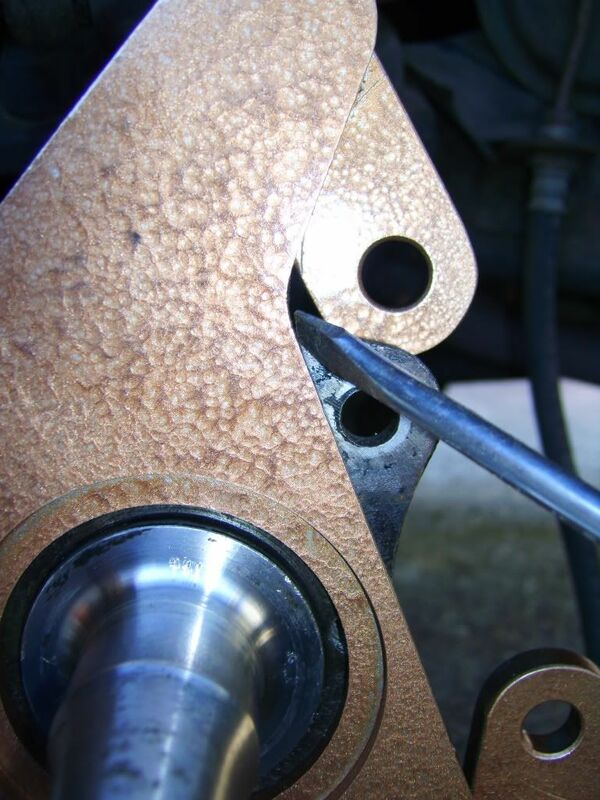 If 1/4" spacers are used, longer studs will be needed. 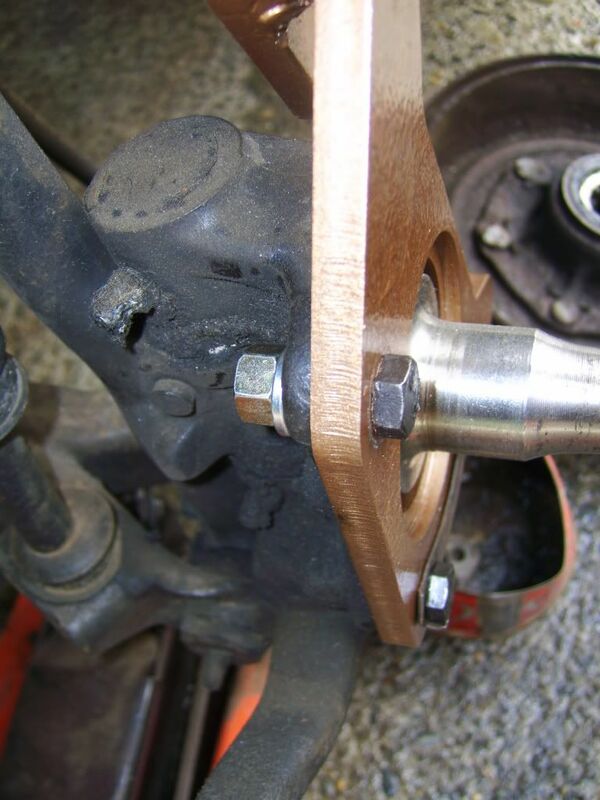 Here's a vid on how to install the press fit adapters onto the spindles without heat. Really long vid. You'll see why I went back to slip fit and loctite. 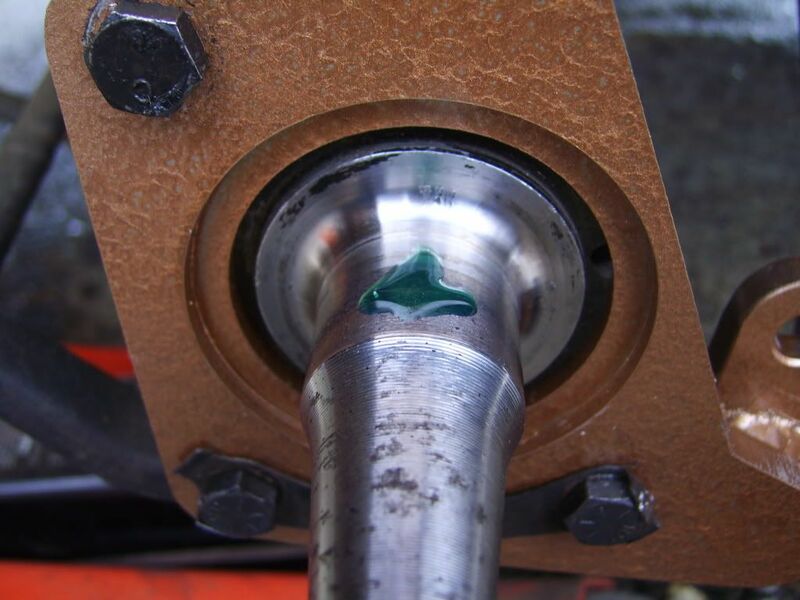 Here's is a video demonstration of installing the slip fit adapters with the Loctite 680. 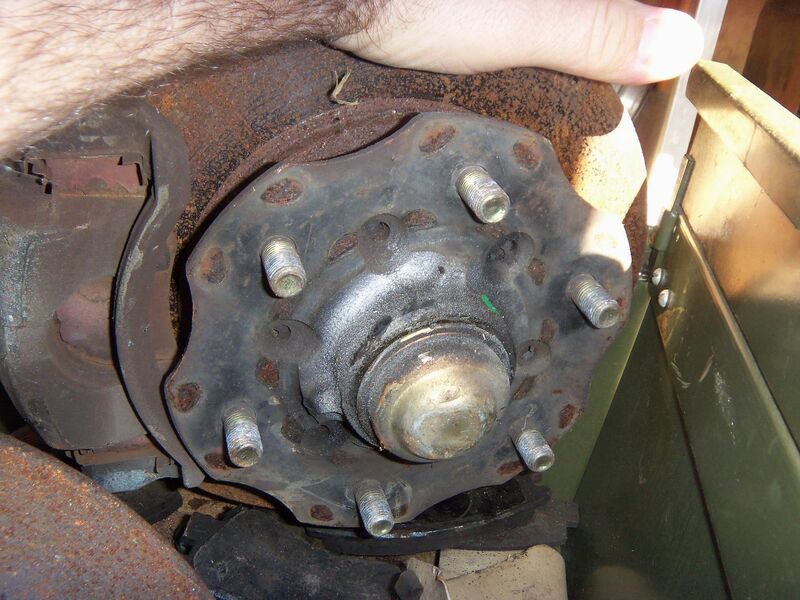 The late(Nov'85 and newer) 720 hubs will not fit in the center of the stock rims. They will need to be machined down. the 620 hubs and pre Oct '85 720 will fit and they can be used with this setup. So, if you're savy with your scrapyarding, you can get 620 hubs, 720 rotors/calipers. The Harbody hubs wil work too, but they need even more material machined off. The price for turning the hubs down will be $60, but if you're not local, you may want to get a local guy to do it. I priced it separately since some guys will have aftermarket rims or use a local shop. This kit simply gets the brakes on the rig. 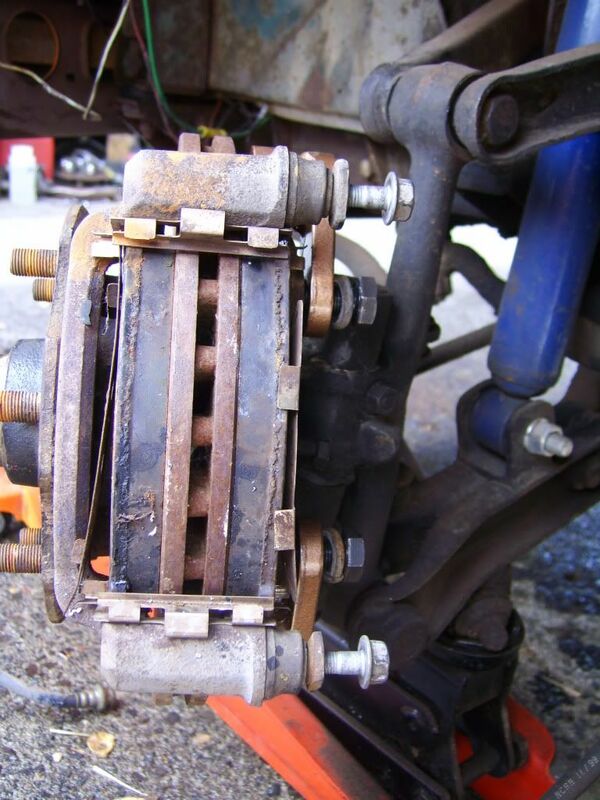 You will still need to deal with the hard brake line on the rig being SAE and the caliper being metric. 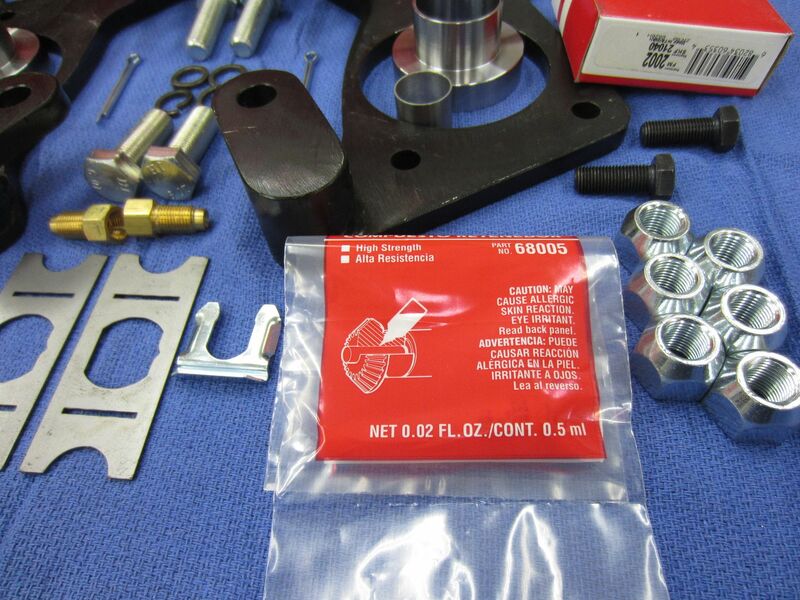 You can get a custom brake line or flare a metric fitting onto the end of the stock hard line. I replaced the entire line. This would be the best time to do an upgrade to a dual resevoir master cylinder. I'm not going to go into that here. You will want to add an adjustable proportioning valve when you do the m/c upgrade. Just wanted to try to give everyone a heads up that, even though this is a sweet upgrade, there's definitely more involved than bolting on this kit. Down to two. Will most likely have an email shortly that will take it down to one. Both of those are going to yahoo forum guys. Wow, you have been busy Mike. They look great, nice to see that quality there. Nice work Mike. I wish I had a truck to put them on. Looks like the last one is spoken for......but if I don't get funds today or tomorrow. I figured I had to give a little time since emailing isn't the fastest way to do it. Hey Mike those brackets look good, I am one of those guilty of the paypal fees, I bought a pair of tailgate handles from you a few years ago for my 521. Thanks again! I was wondering what had to be done to use these on a 320. I have a set but plan on using Toyota stuff up front on the 521 so these are going on my NL if I can make them work, otherwise.............ebay! I'm not understand what "set" you have??? Those three are sold....along with Paula's and Mend's sets.....but I'm already working on getting the next batch going. Since I had sets for the 5 guys that wanted them, I may go to ebay on the next set. Big thanks to the guys that bought them! Take pics when you put them in!! Got creative with a couple of them. Black ones are in the back. Any future brake kits will most likely go straight to ebay unless they have been ordered and paid for up front. I did up the instructions in the word processor. It came out to 12 pages. I thought I'd put the pics into photobucket and see how well it worked on here. At some point, I'll try to upload the file to olddatsuns.com. I'd like to thank Jim for these great pics from his installation! Here's the typical kit. Jim painted his with Hammertone. There's normally two more 3/8" bolts with washers for the upper holes on each bracket. The seals are for an '85 Dodge Mini Ram(D50) and come with the kit. These seals are readily available and are cheaper than the Nissan seals when it comes time to replace them again. Original drums will look like this. You can either use large channel lock pliers to grab the cap and wiggle it off, or pry it off with a screwdriver. 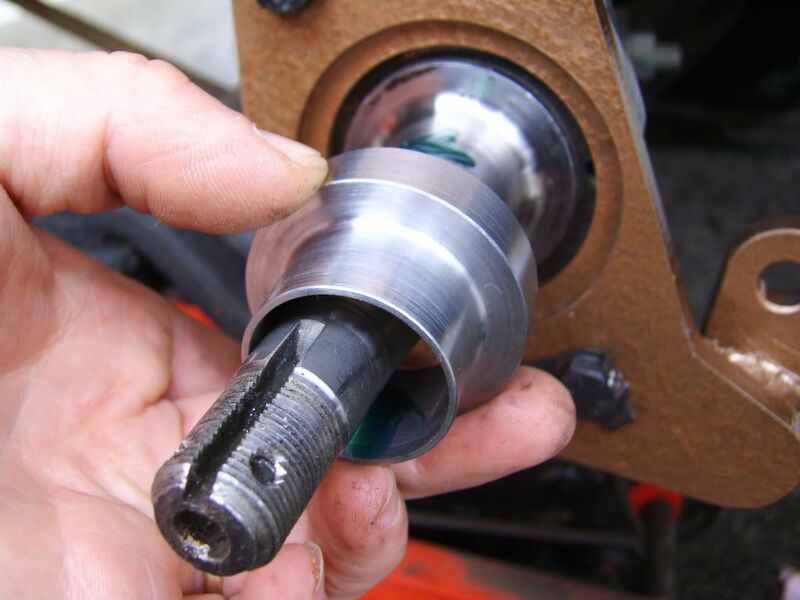 Once you get the cap off, remove the cotter pin and spindle nut. 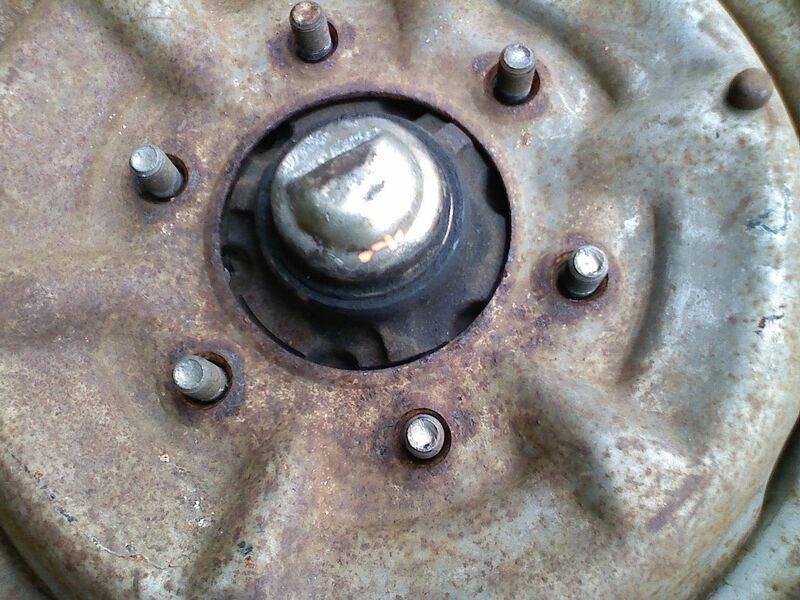 You can remove the screws that hold the drum to the hub, but I recommend simply removing the hub and drum as one unit. 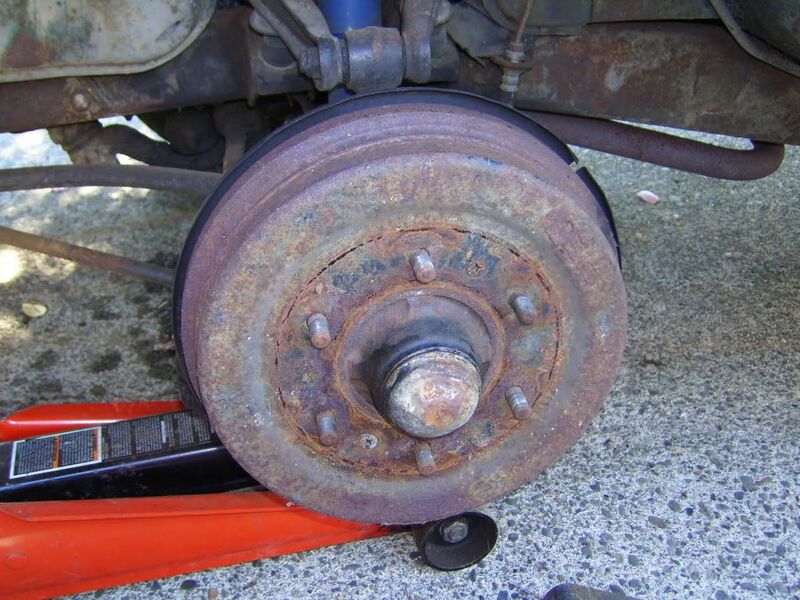 Once you have the hub removed, you should be looking at the brake shoes and backing plate. 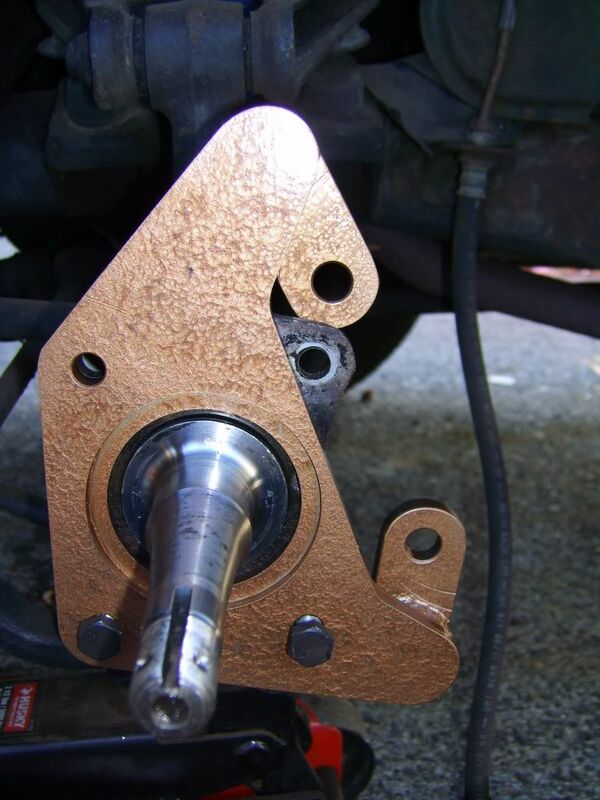 There's no need to disassemble the brake components from the backing plate. 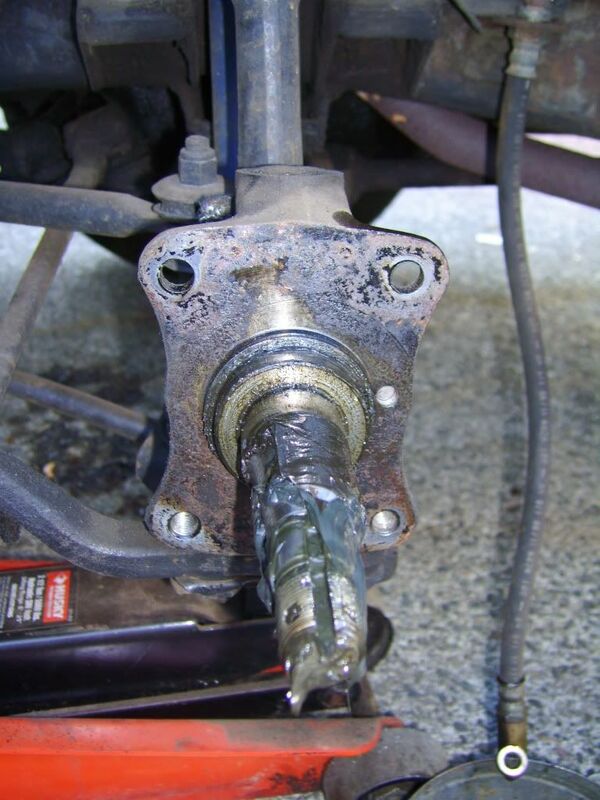 Disconnect the brake line from either the back of the wheel cylinder or from the hard line at the inner fender. Pry the retaining tabs away from the bolts and remove the 4 bolts holding the backing plate to the spindle. The upper two bolts have nuts on the backside. You'll end up with the hub, drum, backing plate laying on the ground and the bare spindle in front of you. 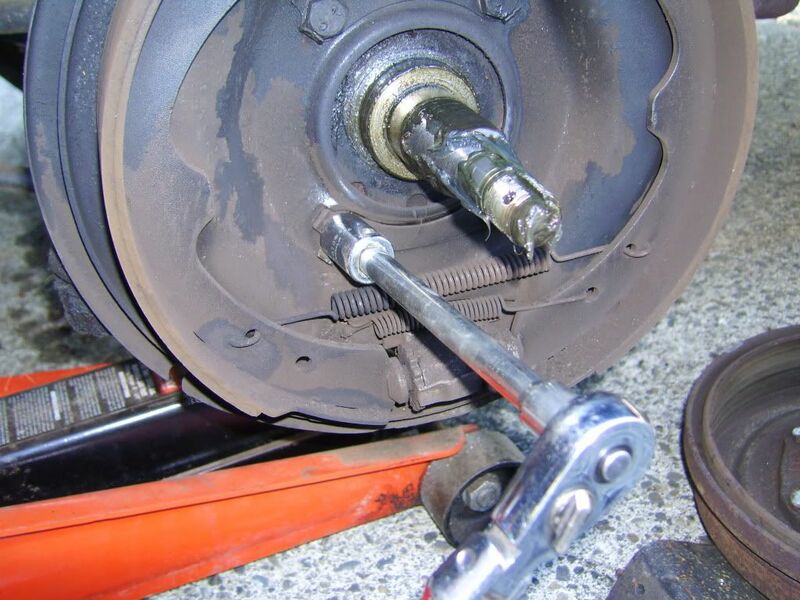 Jim found the easiest way to remove the spindle spacer....a pipe wrench. 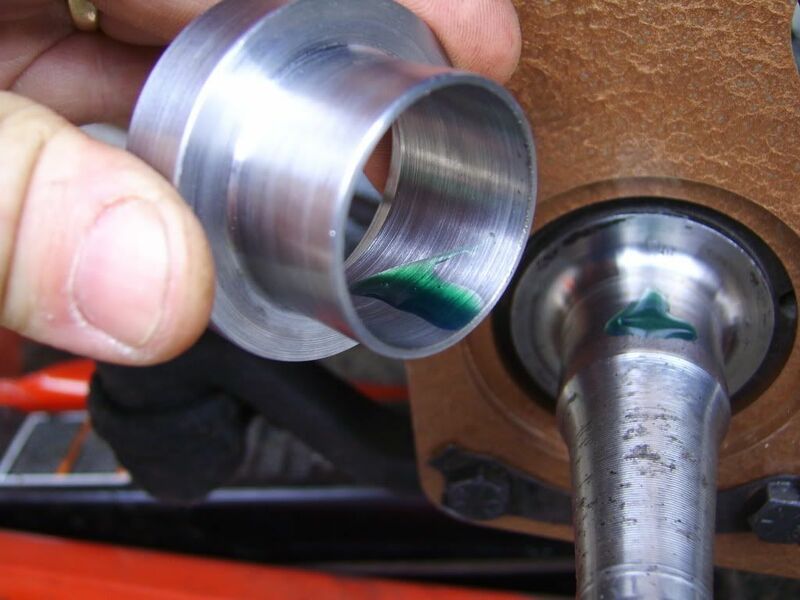 Remove the spacer at the base of the spindle. 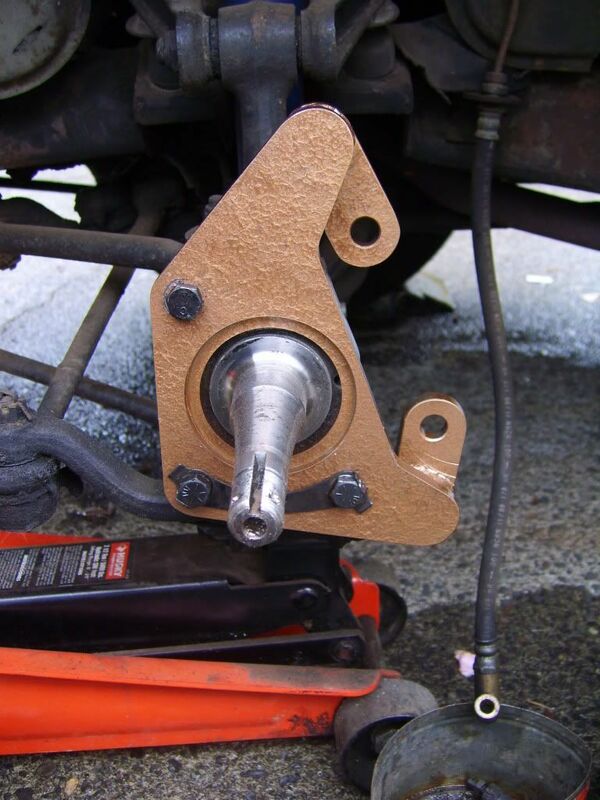 Loosely, mount the correct bracket for the side you are working on. 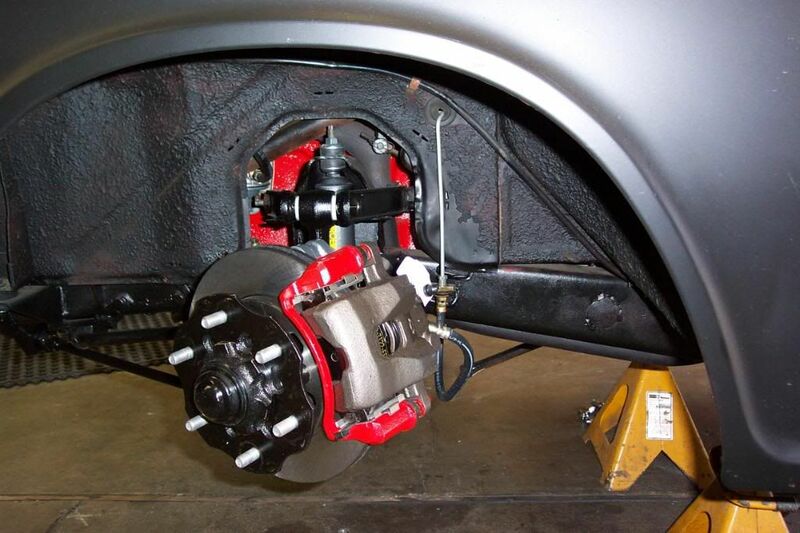 The caliper will mount to the rear. These pictures are of the drivers side. 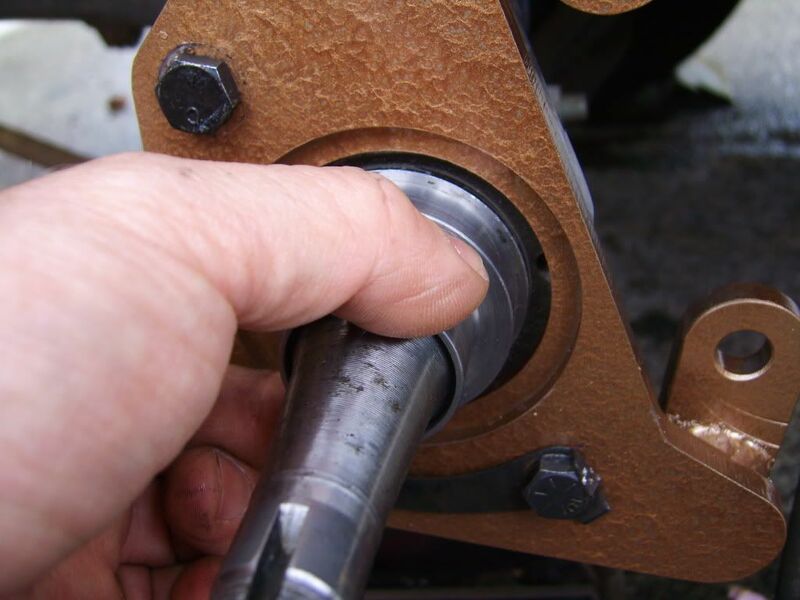 Jim chose a cutoff wheel on a die grinder, but a hand held hacksaw will work too. The steel cuts fairly easy with a good saw blade. Cut the ear off, staying as perpendicular to the face as you can. This cut is for clearance, so keeping it nice is only a matter of cosmetics. This is how it should look when you're done. You can now mount the brackets using the new grade 8 hardware. Two of the 3/8"-24x1" bolts go in the bottom holes, using the original retaining bracket. The longer, 3/8"-24x1.5" bolt goes in the top hole. 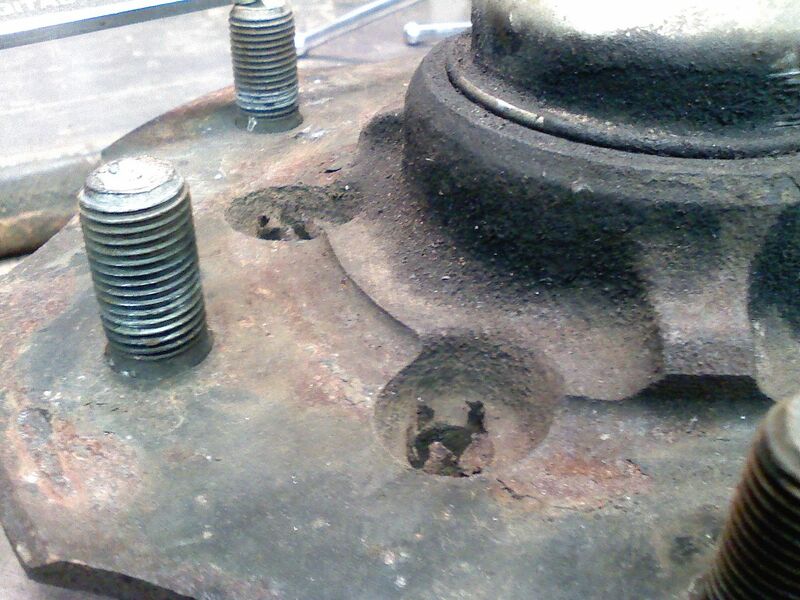 The 3/8" lock washer is used on this bolt since the retaining plate can not be. 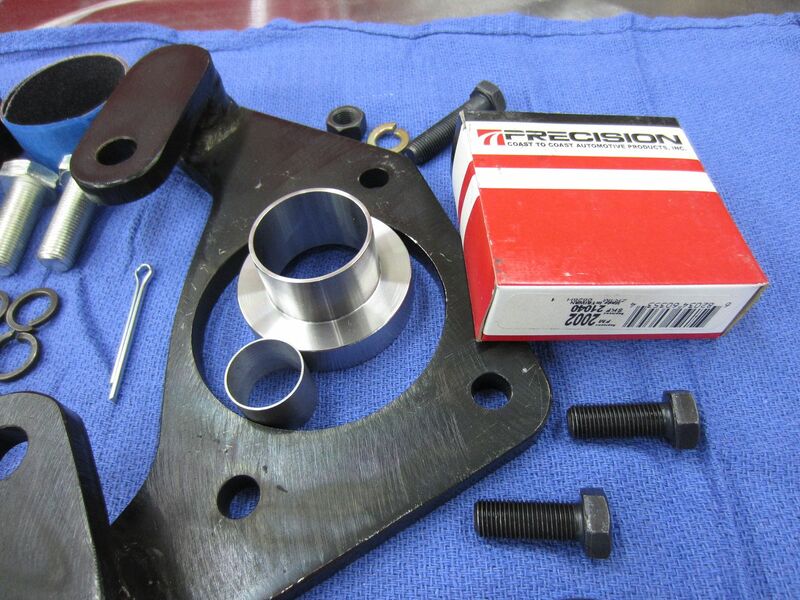 You can loctite the bearing adapters on before you mount the plate. Jim chose to do it after, so for the sake of clarity in the picture sequence, I'll go with that. 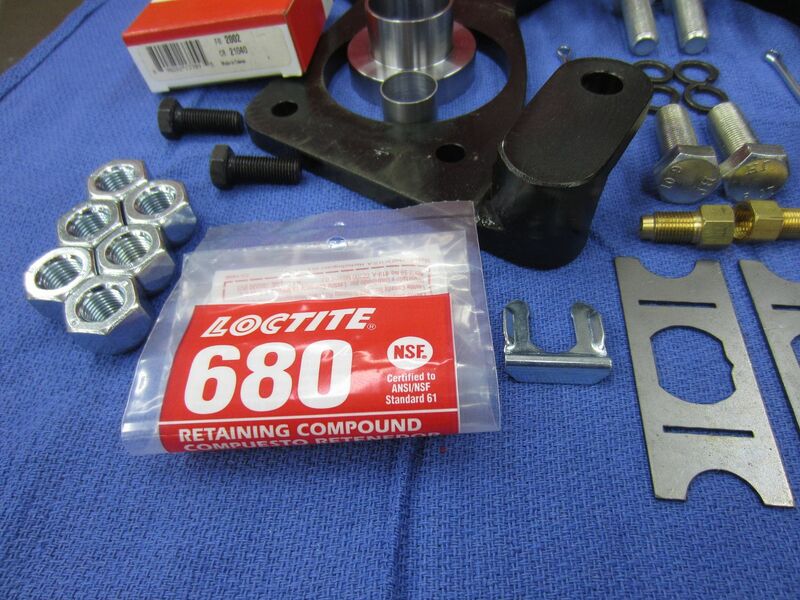 There are two ampules of Loctite 680 in the kit. One per side. This version of loctite is designed for a slip fit and will handle a gap far greater than the one between the adapter and the spindle. Jim used the ampules, as opposed to a bottle like I use when I do it, so you can get a reference for the amount to use from his pictures. 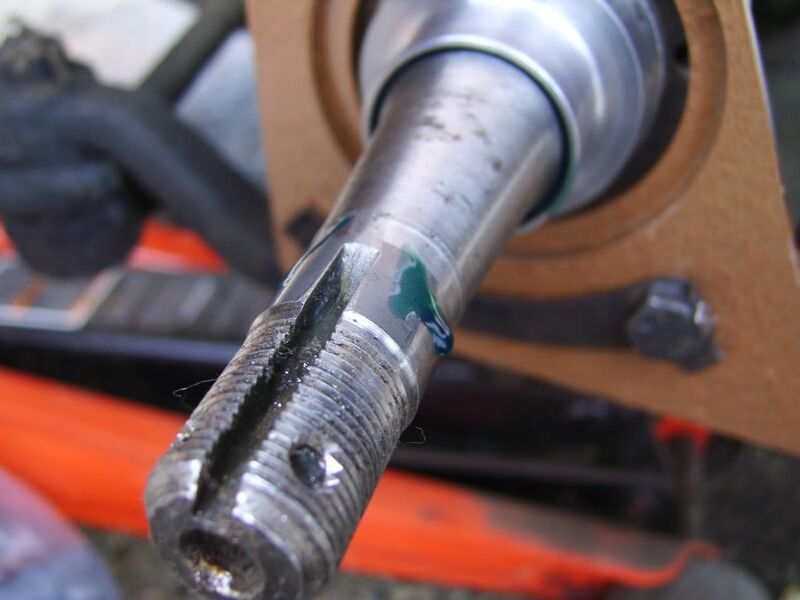 Clean the spindle and adapter with brake cleaner, acetone, or lacquer thinner and make sure it's dry before putting the loctite on. When you place the adapter on, use a twisting motion to spread the loctite around. Try not to get any on the spindle threads. If you do, wipe it off so that it won't interfere when you reinstall the nut. The adapter should stay in place, but you can use a rubber band or some tape to make sure it stays up against the base of the spindle. 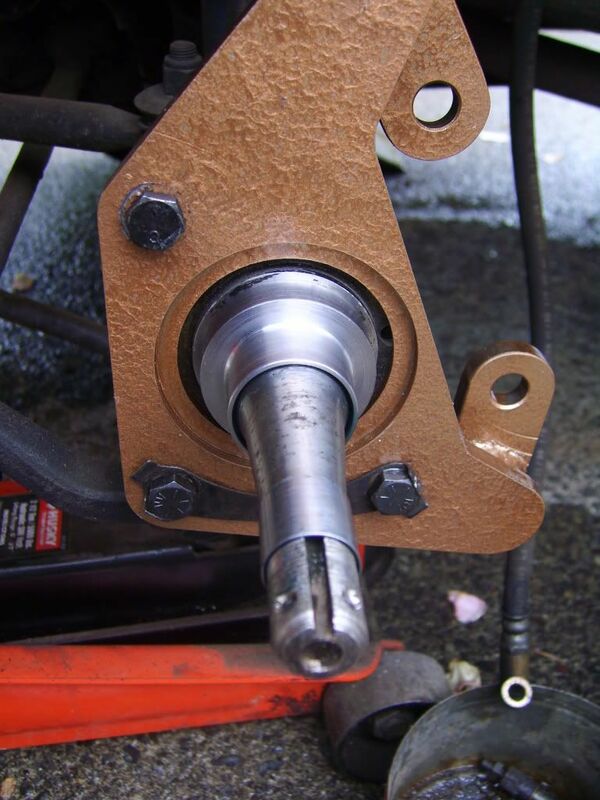 If you are putting the new hub on right away, it will hold the adapter in place when you snug down the spindle nut. Same actions for the outer adapter. Notice that Jim has bent the locking tab into place. 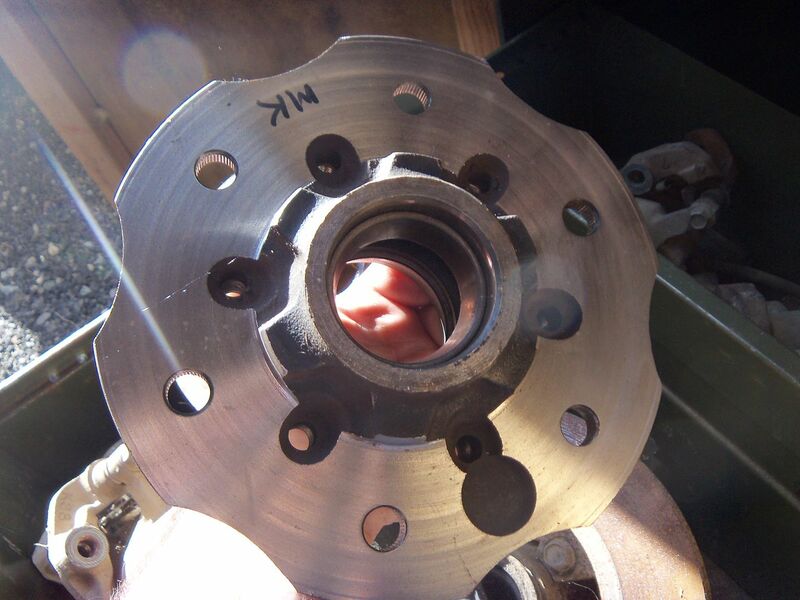 You are now ready to install the hub/rotor onto the spindle. 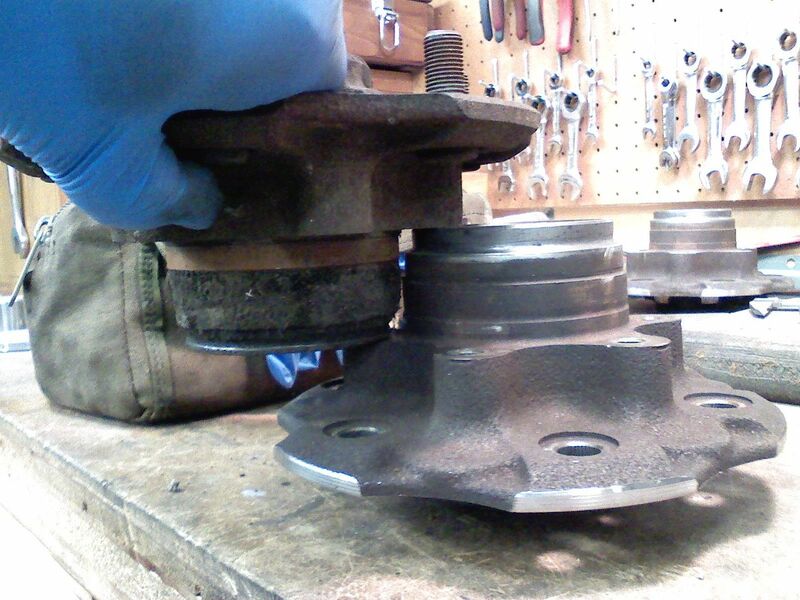 Prior to this installation would be a good time to prep the donor brake parts. 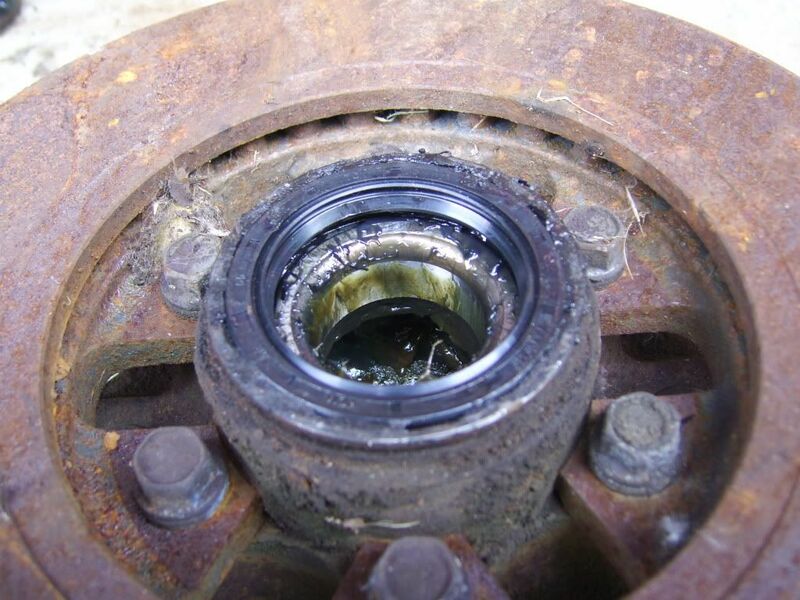 Clean up the hub, replace or repack the bearings. 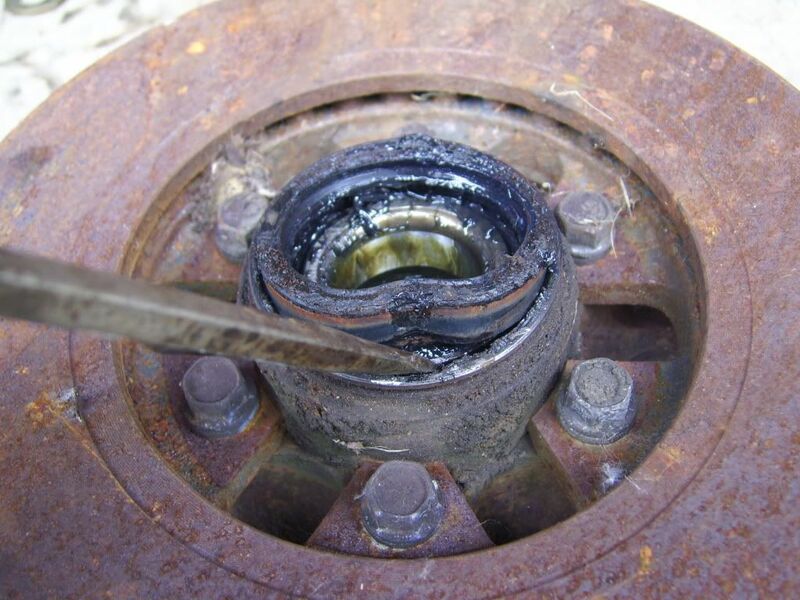 Repacking the bearings, replacing the rotor and servicing the pads are beyond the scope of these instructions. Replace the seal with the new one. The new seal has a smaller inside diameter than the stock, Nissan seal. If you try to use the stock seal, it will not seal against the bearing adapter. 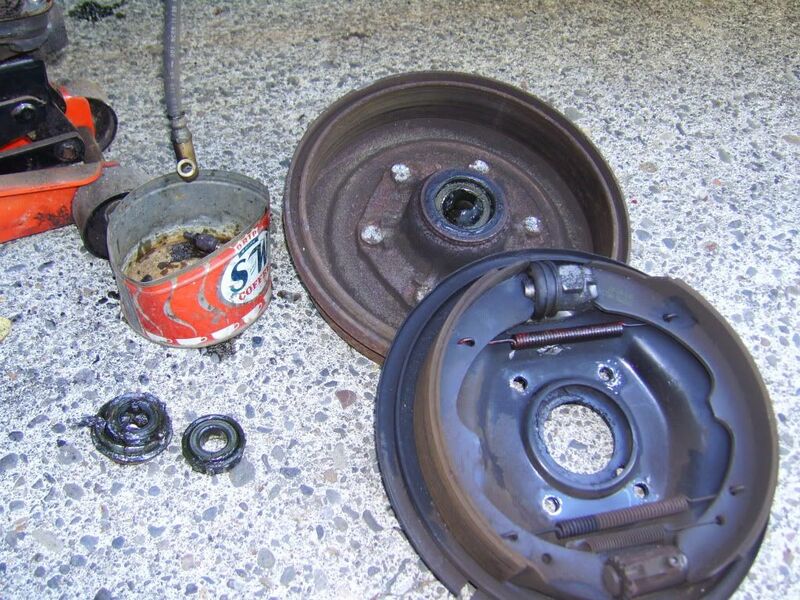 If you are having your disc rotors turned, you would want to have that done before putting the new seal in. Most likely, you've cleaned, painted and had the rotors turned at this point. Yours will look a bit nicer than Jim's which were used in this condition simply for the picture taking. 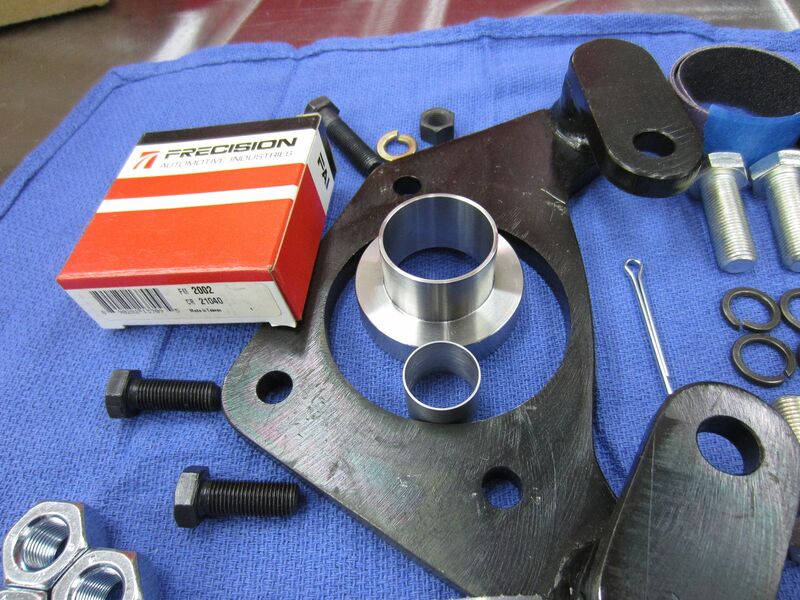 Jim chose to mount the caliper bracket and pads separately from the caliper for clarity. If your calipers are already mounted to the bracket and have pads loaded, you can mount the whole assembly over the rotor as one unit. Make sure to tighten the bolts to factory specs. That's about it for the kit and it's mounting. 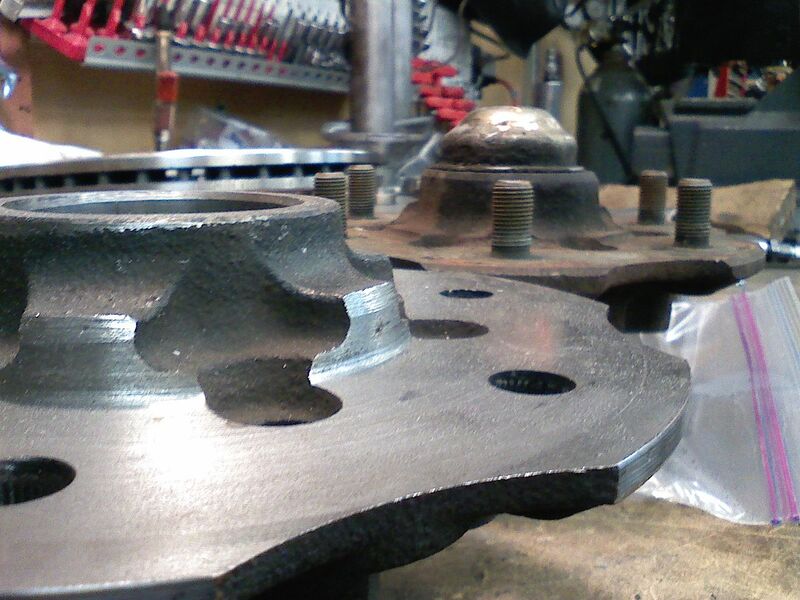 You should now have 10.5" vented rotors where you previously had drums. 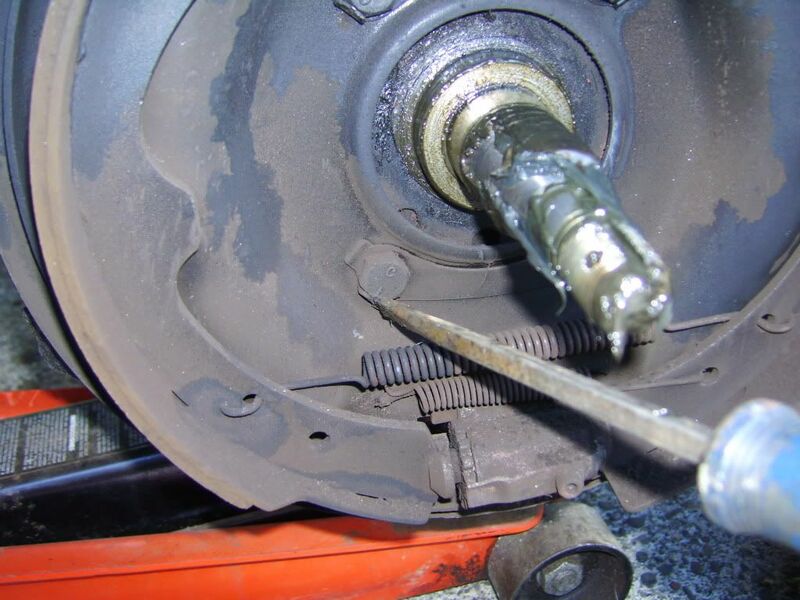 You will still need to mount the brake hose of your choosing. 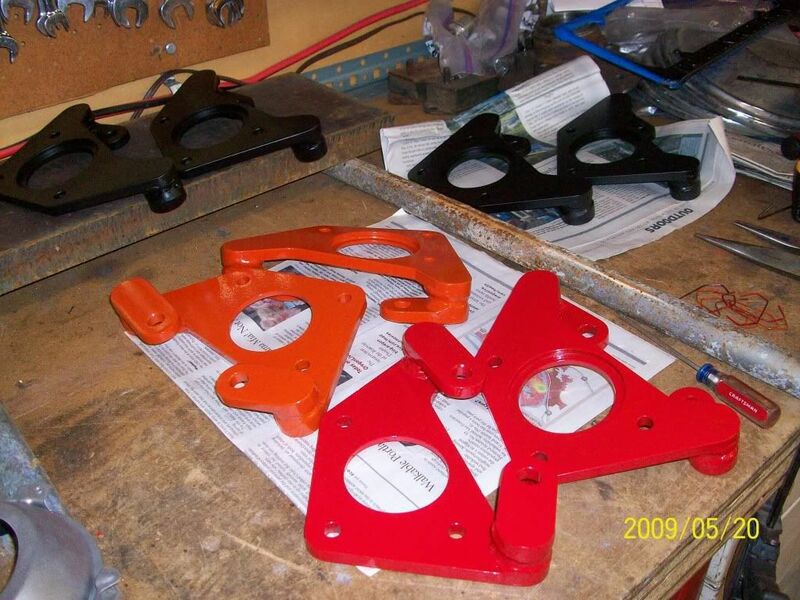 Jim used stock hoses for the calipers he used. You can get generic after market hoses in stainless steel if you like. Neither style of hose will fit the tab on the frame, so you will need to decide which hose, then mount it accordingly. The stock hose will have a metric fitting at both ends. The line on the truck will be an SAE fitting. 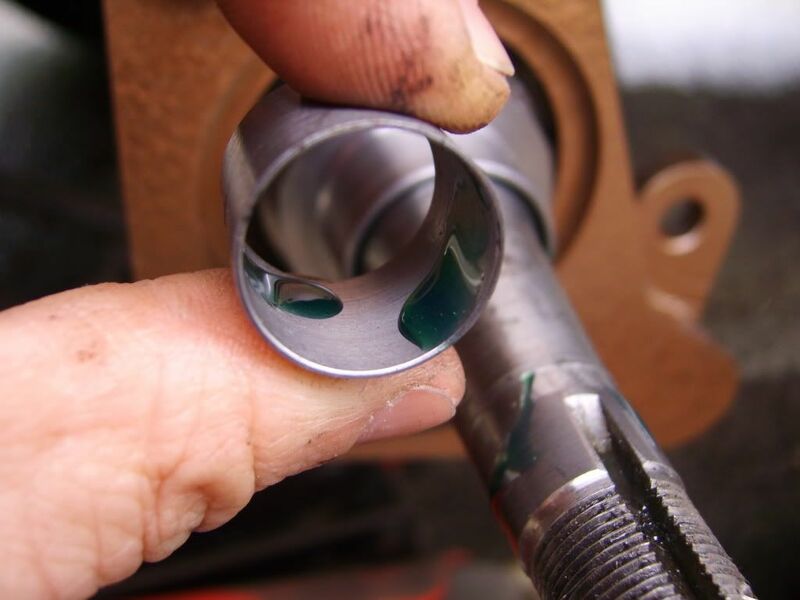 You can cut off the old one and flare a metric line nut onto the end of it. I would highly recommend upgrading to a dual reservoir master cylinder. 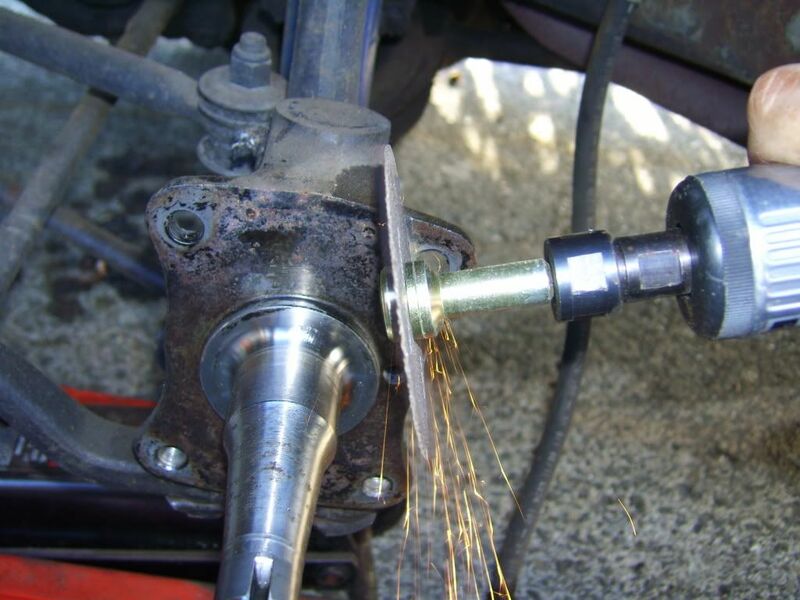 If you do this, you can run new, metric brake line from the m/c to the soft lines on each side. 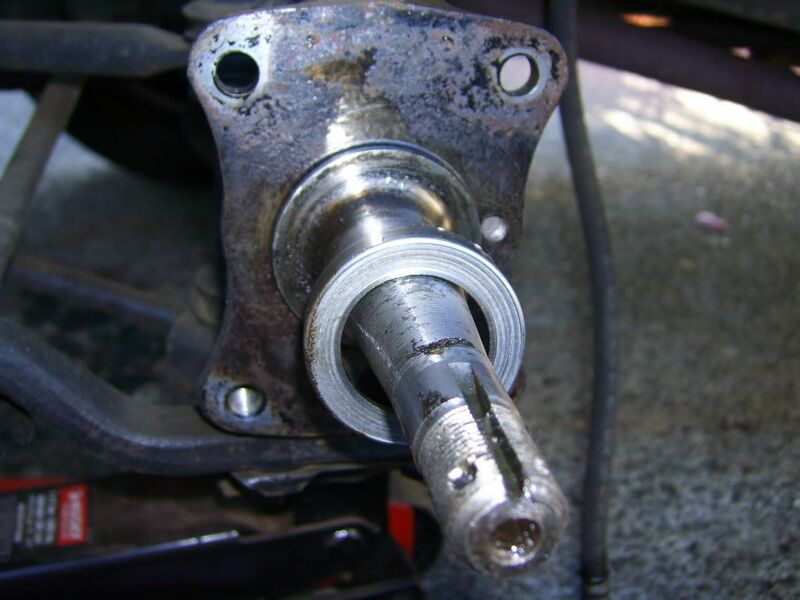 For best results, you will need to install an adjustable proportioning valve into your rear brake line. If you have any questions, feel free to email/pm me. 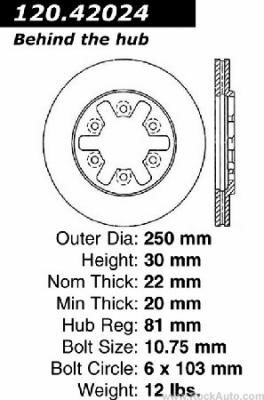 Does this change the offset at all for the wheels? looking at it concidering it still uses the same spindle i would think not am i right mike? You're about half right. :) It does actually change it a bit, but I'll have to measure it to see how much. 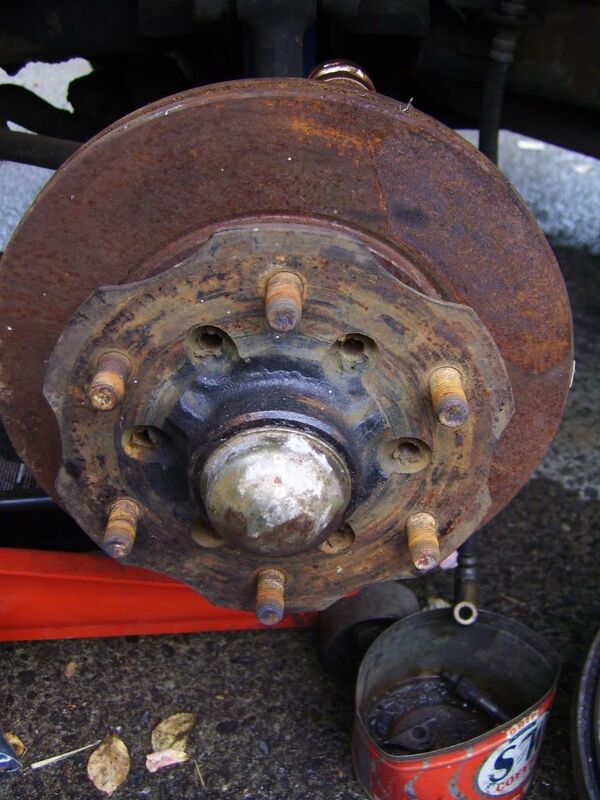 The change occurs because of the wheel mounting surface is located differently between the two hubs. I dug around a bit and this pic shows how the difference comes about. 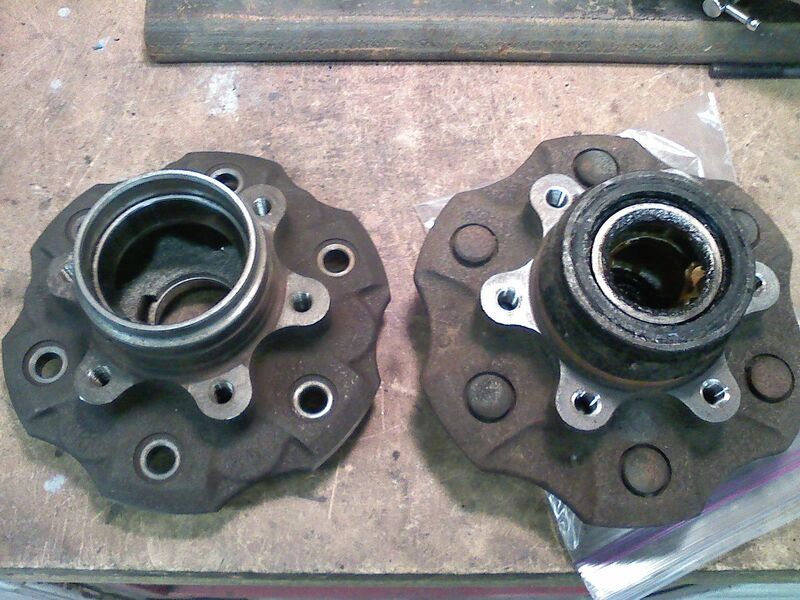 The hub on the left is NOT the 720 hub so this pic is only an example. I can make some measurements some time. 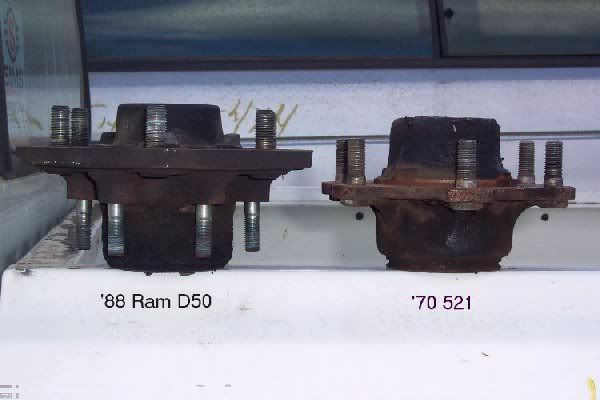 I need DATSUN 320 520 521 620 DISC BRAKE CALIPER BRACKET please let me now if you have...if so , how much shipping to shizuoka 434 - 0043 japan? hey is there a five lug option on that kit? 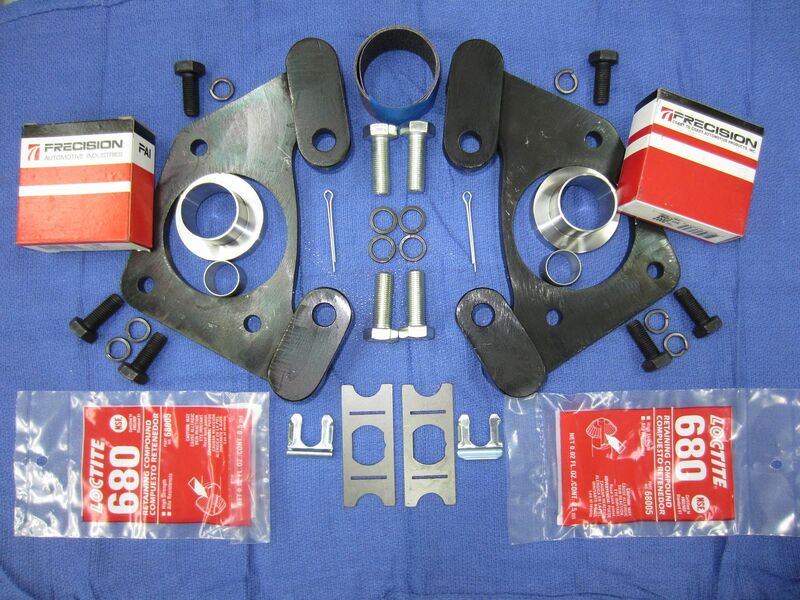 HiI need DATSUN 320 520 521 620 DISC BRAKE CALIPER BRACKET please let me now if you have...if so , how much shipping to shizuoka 434 - 0043 japan?Thank you very much! I sent a pm with a quote within a day or two of this post..... 8lbs + $45. Never got a reply. Sorry, no 5 lug version. I've getting questions about which parts to use so I looked back through the thread and realized that it's not extremely clear. So, I did a bit of cut/pasting on RockAuto to help clarify a bit. 720 donor years. '83-84 and early 85. 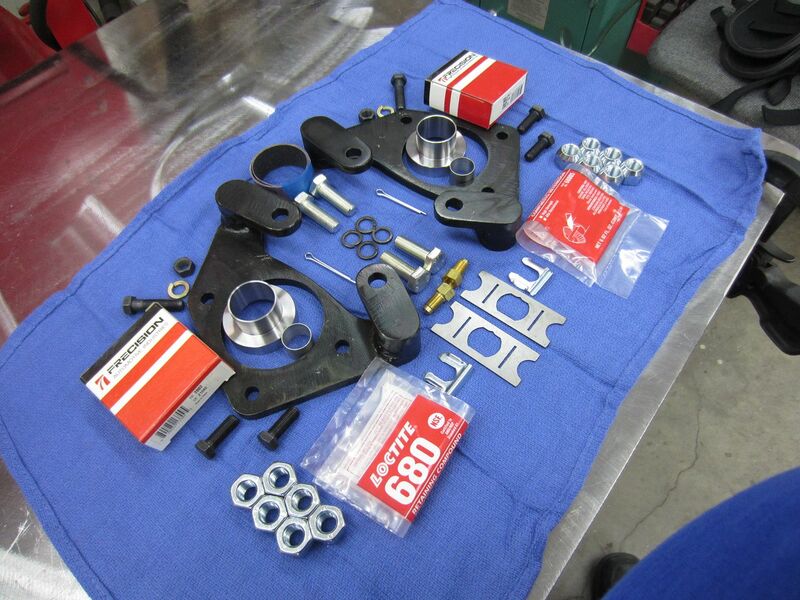 The '83-early '85 hubs/rotors/calipers can all be used. Hub will require some metal removal to fit stock rims. 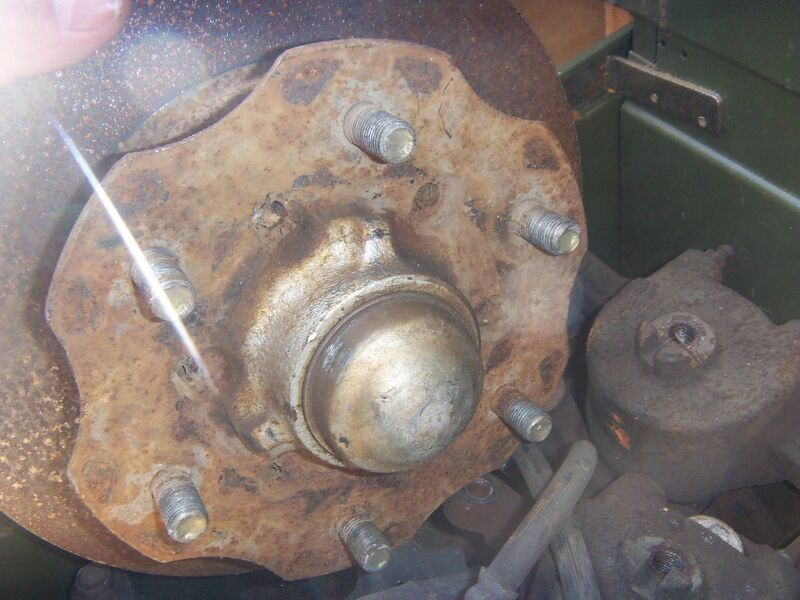 The '82 used 620 style brakes, so only the hub can be used. This hub(I believe...hard to remember) will not require any metal removal to fit stock rims. 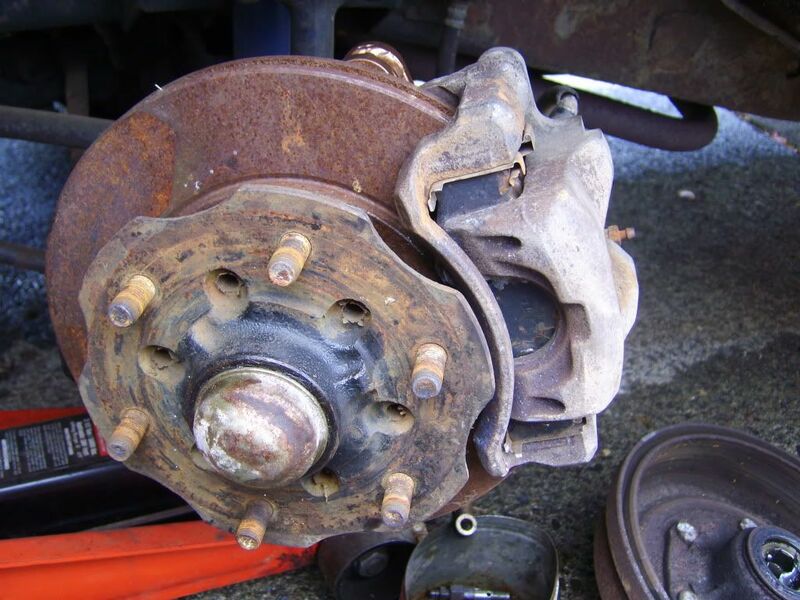 The late '85 used Hardbody style brakes, so the hub/caliper can be used, not the rotor. 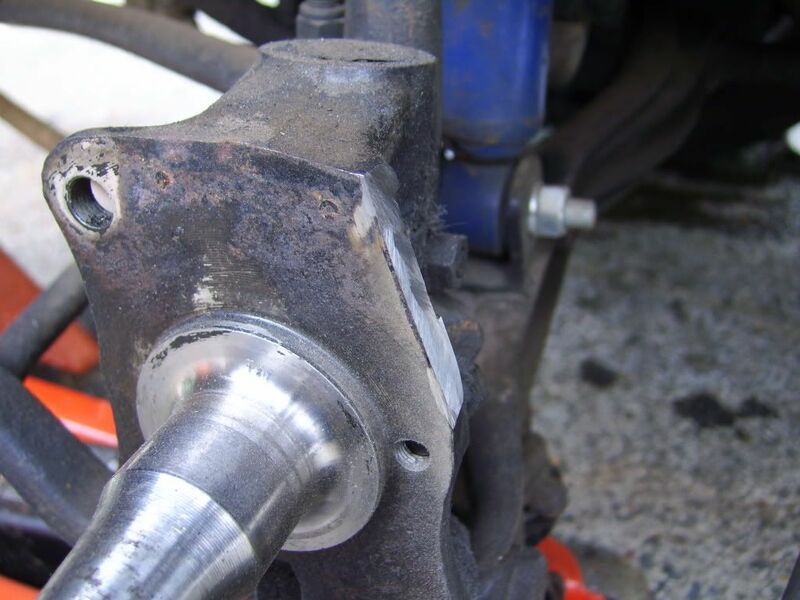 This style hub will require the most metal removal to fit behind stock rims. 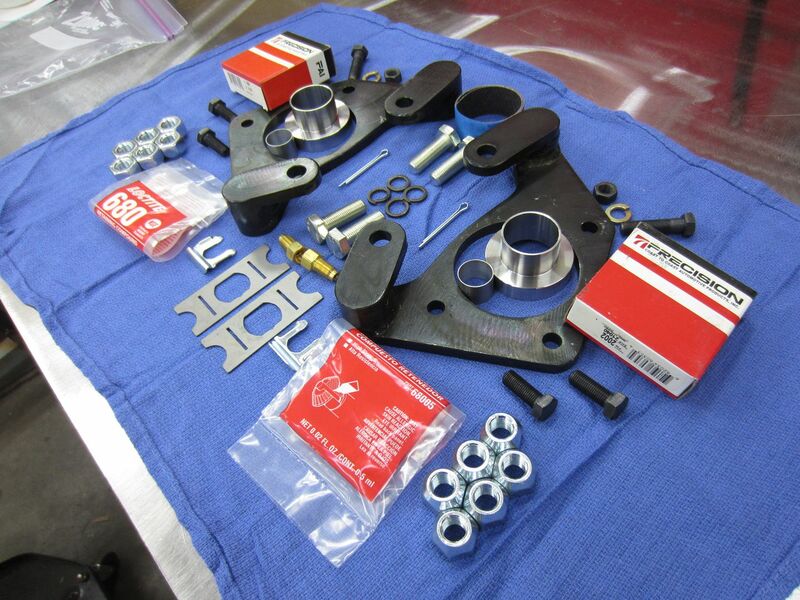 If you are chasing down new parts, here are some part numbers to reference. There are many more brands/numbers, but most can be cross referenced from these. 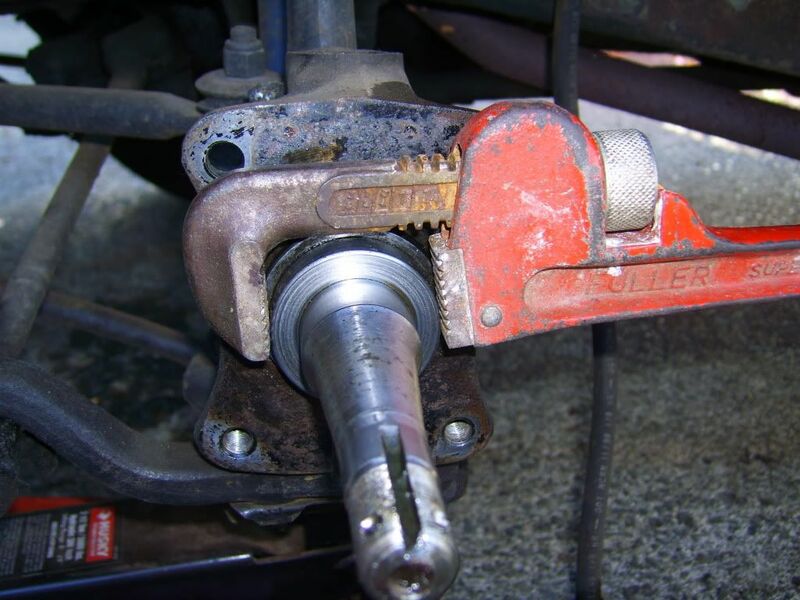 The caliper is listed as well as the caliper with the bracket. If you got donor parts, you should have the bracket. If you're buying new, you need the ones with the brackets. 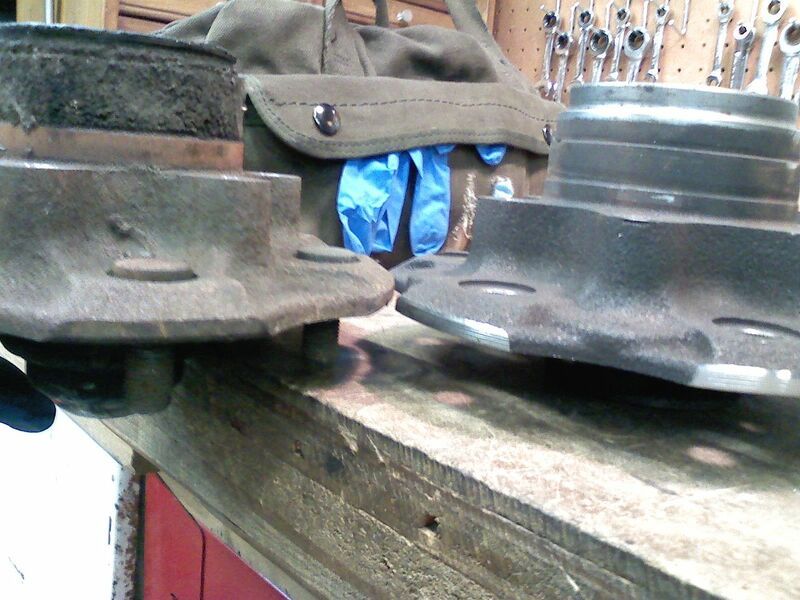 When looking at '85 720's, the difference between useable and not is the top hat of the rotor. You want the shorter top hat. I use a seal from a 1985 Dodge Ram 50. It's smaller and cheaper. I picked up some '79(that's what it said inside the door) 720 hubs today. Thought I'd put up some pics that show the similarities and differences. The clean, shiny one is a Hardbody hub that has already been cut down on the lathe. 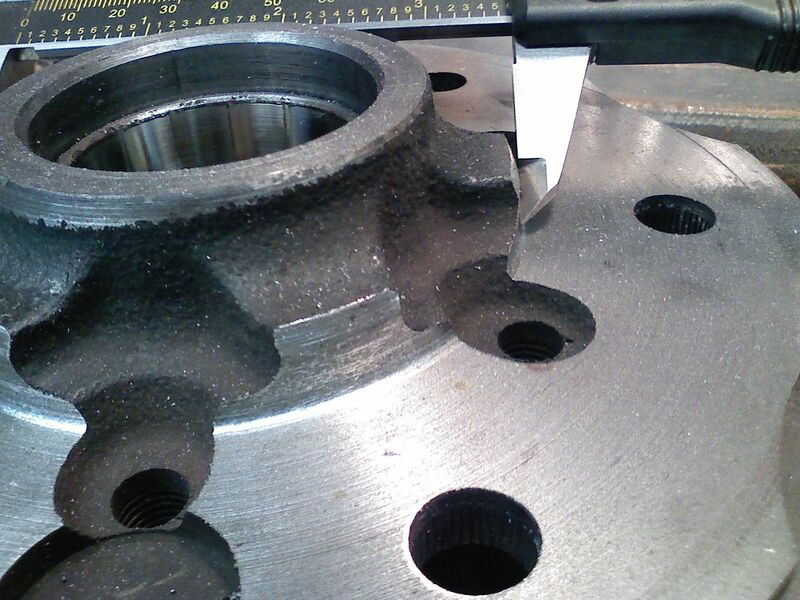 As you can see from the pic of the 720 hub in the stock 320 rim, it will not need any cutting. The Hardbody was a much heavier rig and probably had a bigger payload capacity....so you can see how the differences between the two hubs were to strengthen the HB hub, but for the dimension I'm concerned with in this use, the 2 hubs are the same. :) ...oh...I set the caliper on the 720 hub, then laid it on the HB hub to show that I've turned it to the same dimension.